Television, event, and sports broadcasters have long relied on a diverse array of legacy and newer network technologies to deliver critical video, audio, and data signals from venue to destination. 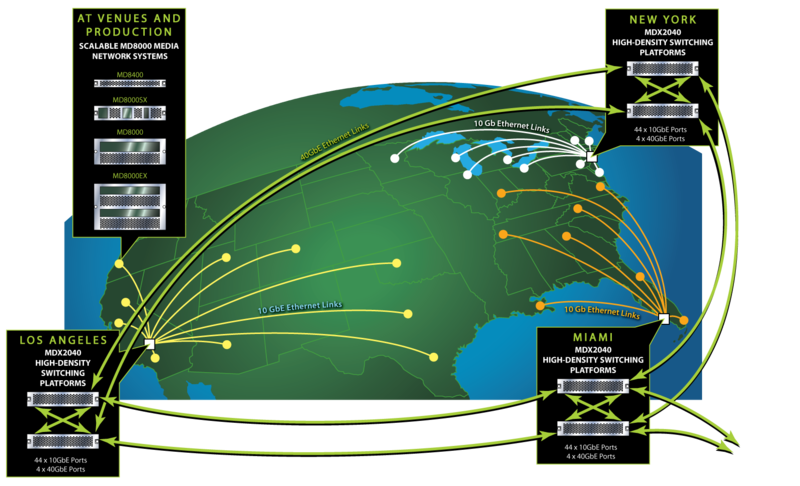 This varied mix of legacy and current WAN transport methods includes satellite and microwave feeds, SONET and SDH networks, dark fiber, MPLS networks, metro Ethernet, and ATM, DTM, and DWDM transmission systems. While each of these technologies offers users benefits in terms of rate, reach, and cost, their continued use has left broadcasters with a disjointed set of networks that are expensive to operate, hard to provision, and difficult to troubleshoot. Due to network fragmentation and isolation (islands of connectivity), critical items such as Quality of Service (QoS) guarantees, end-to-end circuit visibility, multipoint connectivity, and error protection are often lacking in these solutions. Over the past decade, however, the old rules surrounding broadcast video networks have begun to shift, with next generation WAN IP networks emerging as the clear front runner among competing transport technologies. Popular applications using next generation IP networks are numerous and include live sports, live event contribution, stadium-to studio and studio-to-studio connectivity, remote production, and mobile studios. Broadcaster adoption rates have been high; the reasons behind the success of IP WANs are compelling.